Two-minute takeaway: What is Infiltration? When rain hits plants, buildings or the ground, there are a couple of directions it can go, such as flowing over pavement and into a nearby stormwater gate or creek or soaking into the ground to be absorbed by plants and recharge groundwater. This process of water on the ground soaking into soil is known as infiltration. Pavement, buildings, and even grass can get in the way of this process. Water that doesn’t infiltrate travels over the ground, contributing to flooding and picking up pollutants before entering stormwater systems and flowing into local waterways. Bringing more nature into our cities and towns, such as trees and native plants with long roots, can help slow the flow and encourage this infiltration. When water soaks into the ground, soil and plants work together to absorb it, filtering pollutants, and decreasing flooding. Some of this water continues to travel down in the soil, becoming cleaner as it goes and recharging the groundwater. This groundwater provides a source of well water and contributes to healthy flows of creeks and rivers. 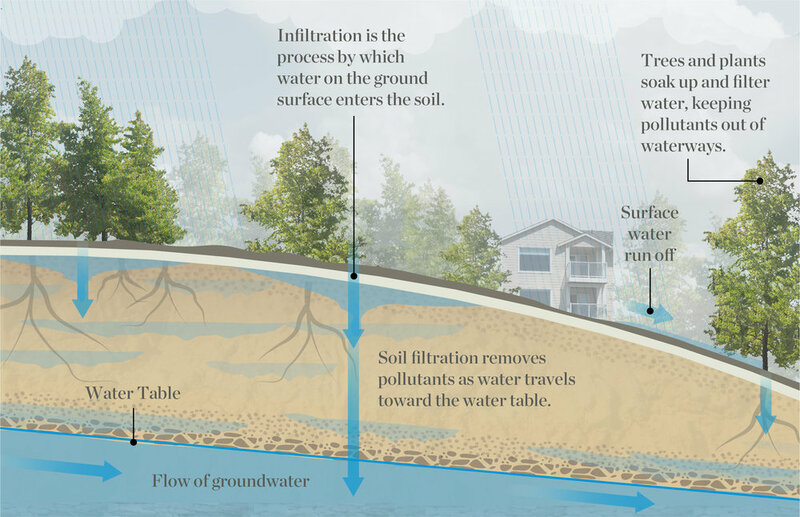 When we make space for water to infiltrate underground, we experience the benefits aboveground — healthy trees and plants, clean water, drier basements, and much more.